Every Christian must be a soul winner, declared an African church planter who oversees a fellowship of more than 18,000 local churches. Alex Mitala, the general overseer of the National Churches of Uganda, pointed to the Bible and said the Scripture says all believers are called to participate in a soul-winning campaign. "He wants people to believe Him after repenting of our sins, to grow and then after to become disciples," Mitala told The Christian Post. "Every believer must be a soul winner. Every believer is empowered according to the Bible." The church planter, who is commonly referred to as Mutame (Apostle) Mitala, has worked with his team to plant more than 145 churches in Uganda and Kenya, and build orphanages, schools and pastor-training facilities. He and his wife Catherine have adopted 11 orphans and have six biological children. God calls people to serve in different ways, Mitala said. But whether they are a businessman, a farmer or a musician, a believer has to be a soul winner. It is the church pastor's responsibility to disciple the members of their church so that everyone can go out and share the Gospel. Fellow African church leader Ademola Ishola, the general secretary of the Nigerian Baptist Convention, which has over 10,000 member churches, called soul winning a "spiritual responsibility" of every believer. "The need to empower all members of the church is essential," said Ishola. He noted that on average less than 20 per cent of members of a church are active. "That means 80 per cent of the manpower is lost," said the Nigerian church leader. "Pastors need to train everyone in that (soul winning) aspect." Mitala and Ishola were among the dozens of church leaders and pastors that gave presentations at the second biennial Synergize conference last week in Orlando. As the name suggests, the conference was meant to network key leaders around the world in order for them to share and combine resources, or synergise their efforts, to fulfil the Great Commission. 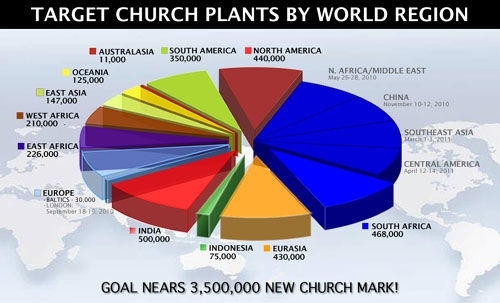 The common goal is to double the size of the church through five million new church plants throughout the world to bring the next billion people to Christ. The Second Billion Network hopes to achieve the goal of a billion new Christians in the next 15 years. James O Davis, founder and president of the Second Billion Network, which organised the Synergize 2! Pastors Conference, said the plan for the upcoming two years before Synergize 3!, is to finish all the regional summits and to make all the resources collected through the regional and the international conference available online.